Are you one of the more than 50 million Americans with allergies? It seems like everyone I know is an allergy sufferer, including me. It’s bad enough to get a runny nose and watery eyes at certain times of the year, but imagine having symptoms every time you put food in your mouth. That doesn’t sound good at all. But that’s the case for four to six percent of children and four percent of adults in this country, or 15 million Americans, who the US Centers for Disease Control and Prevention estimate are currently suffering from food allergies. The latest research also shows the number of children under age 5 diagnosed with peanut allergy has increased by 100 percent. Substances that trigger an allergic reaction are called allergens. Pretty much any food can be an allergen, but there are a few that are the biggest offenders. 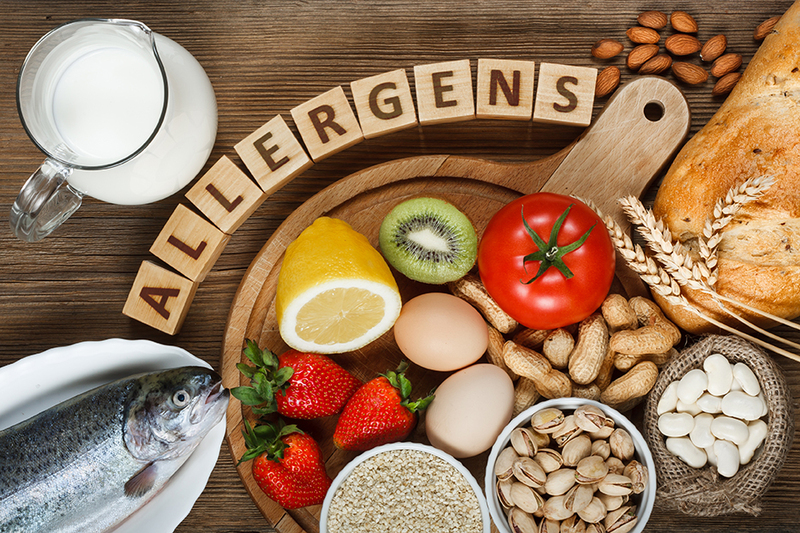 These eight types of food account for about 90 percent of all allergic reactions: Eggs, milk, peanuts, tree nuts, fish, shellfish, wheat and soy. There’s good news and not-so-good news when it comes to these allergens. Allergies to milk, eggs, wheat and soy may disappear over time, but allergies to peanuts, tree nuts, fish and shellfish tend to hang on for life. Also, you can develop an allergy to a food you’ve never been allergic to before. That’s a bummer! So, what causes food allergies? These allergies are an overreaction by the body’s immune system to proteins in certain foods that it detects as foreign and attacks. The immune system reacts by triggering its white blood cells to produce food-specific immunoglobulin E (IgE) antibodies to neutralize the allergens. When the allergic person eats the offending food, the IgE antibodies detect it and signal the immune system’s mast cells to release a chemical called histamine. Histamine is responsible for the symptoms of food allergies, just like it leads to the runny nose and itchy, watery eyes of respiratory allergies. Symptoms of a food allergy can be uncomfortable, but not serious. These include a rash on the skin, tingling or itching in the mouth, lightheadedness, nausea, diarrhea, stomach cramps and coughing. Other symptoms can be serious and even life threatening. These include panting and wheezing; swelling of the throat, making it difficult to breath; blue lips from lack of oxygen; a drop in blood pressure and heart rate, dizziness, fainting and unconsciousness. These are some of the symptoms of a whole-body allergic reaction called anaphylaxis, which is potentially deadly if not treated right away. It’s a no-brainer that the best way to dodge food allergy symptoms is to avoid the trigger foods altogether. But even if you’re careful, you may be exposed unknowingly. The best way to prepare for any potential reaction is to have an allergy action plan, created with help from your doctor. Education is an important part of your plan. Due to the prevalence of food allergies in this country, manufactures are required to label their products indicating if they contain any amount of the most common allergens. So learn to read labels, and don’t forget the flavorings and additives. They might contain trace amounts of the offending allergens. Also, don’t be afraid to ask your server or the chef about the ingredients in your meals when you go out to eat. Remember, you can have a reaction even if the cooking surface or pans used to make the food have come into contact with an allergen. So, be aware and ask about how your food is being prepared. When a person is diagnosed with a food allergy, the doctor generally prescribes an auto-injector of epinephrine to be used if symptoms of anaphylaxis occur. If they do, the person, or someone close to him or her, should inject the epinephrine into the outer thigh as soon as the symptoms appear. Then, the person needs to go immediately to an emergency room for follow-up care. If your child has a food allergy, be sure his or her teachers and other close adults are aware and know what to do in case of a reaction. They should understand how to use the epinephrine auto-injector and to get the child to the ER right away. We all eat. Unfortunately, it can be a risky experience for some people. You can help by being patient with people who have food allergies and learning what to do if someone close to you has a serious reaction such as anaphylaxis. Sharing what you learn is the best was to celebrate Food Allergy Action Month in May! I’m very pleased to find this page. I need to to thank you for ones time due to this fantastic read!! I definitely liked every little bit of it and I have you book-marked to look at new things on your blog.